Darran O’Sullivan of Kerry in action against Martin Mc Mahon and Gordon Kelly of Clare during their Munster championship game at Killarney. Photograph by John Kelly. 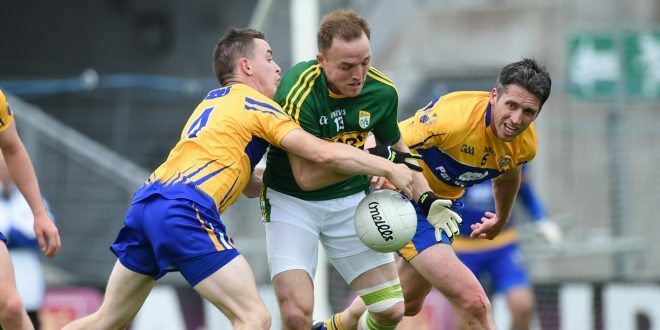 MUNSTER champions Kerry cruised into a provincial final meeting with Tipperary following a very comprehensive defeat of Clare in Killarney on Sunday. The four in a row chasing Eamon Fitzmaurice managed Kerry men finished with 13 players following an injury to Killian Young and a black card for Michael Geaney but it made no difference. They had made six substitutions when Young got injured and couldn’t replace him or the black carded Geaney. Clare, who trailed 2-10 to 0-9 at half-time, were hit by a savage blow as the game ticked into its second minute when a Colm Cooper shot for a point drifted over the head of Joe Hayes and full back Kevin Harnett. Within five minutes Kerry corner forward Stephen O’Brien, who scored 1-4 in the opening half, put away his goal after Bryan Sheehan won a contest for a Clare kick out with Gary Brennan. Paul Murphy made a support run and O’Brien finished the home teams second goal. Martin McMahon was in trouble on O’Brien from the opening minutes although he wasn’t offered much protection as Clare did not employ a permanent sweeper. Clare looked very tentative at times in the opening half. However they did put together some nice moves with Gary Brennan, Cathal O’Connor and Podge Collins pointing impressively. Unfortunately Podge Collins was black carded in the 27th minute for tripping Tadhg Morley. Collins had been Clare’s most threatening forward up to that point and had the beating of Kerry debutante Brian O’Beaglaoich. It could have been worse for Clare at the interval as only a last ditch Gordon Kelly tackle in the 26th minute denied Darran O’Sullivan a goal chance. Kerry outscored Clare 0-13 to 0-8 in the second half and while they kicked some good scores, Clare never got close to threatening to pull within distance of their opponents. One bright spot for Clare was the second half display of Pearse Lillis who kicked 0-3 from play. He had been introduced as a replacement for Podge Collins late in the first half. Clare lost Gordon Kelly to a black card late in the second half but at that stage the game was well over. Clare now have no option but to prepare for the All-Ireland qualifiers in the hope that they can significantly up their performance levels. Kerry will play Tipperary in the 2016 Munster final. Clare: Joe Hayes (Lissycasey); Dean Ryan (Éire Óg), Kevin Harnett (Meelick), Martin McMahon (Kilmurry Ibrickane); Seán Collins (Cratloe), Gordon Kelly (St Joseph’s, Miltown), Cian O’Dea (Kilfenora); Gary Brennan (Clondegad-captain), Cathal O’Connor (Coolmeen); Eoin Cleary ((Miltown), Jamie Malone (Corofin), Shane McGrath (Thomas Davis); Keelan Sexton (Kilmurry Ibrickane), David Tubridy (Doonbeg), Podge Collins (Cratloe). Subs: Pearse Lillis (Cooraclare) for Podge Collins (28 BC), Pat Burke (Kilmacud Crokes) for Shane McGrath (45), Shane Hickey (Kilmurry Ibrickane) for Seán Collins (52), Seánie Malone (Miltown) for Cian O’Dea (61), Declan McMahon (Cooraclare) for Gordon Kelly (66 BC). Scorers: David Tubridy (0-7, 0-4f, 0-2 45), Pearse Lillis (0-3), Eoin Cleary (0-3, 0-1f, 0-1 SL), Gary Brennan (0-2), Podge Collins, Cathal O’Connor (0-1 each). 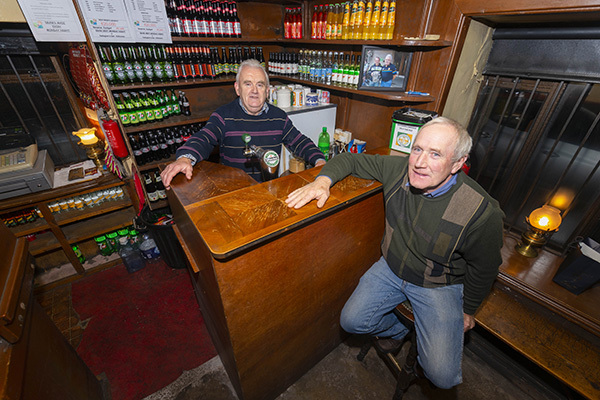 Black cards: Podge Collins, Gordon Kelly. Kerry: Brian Kelly; Shane Enright, Mark Griffin, Killian Young; Brian O’Beaglaoich, Peter Crowley, Tadhg Morley; Kieran Donaghy, Bryan Sheehan (captain); Paul Murphy, Colm Cooper, Donnachadh Walsh; Darren O’Sullivan, Paul Geaney, Stephen O’Brien. Subs: Marc O’Shea for Tadgh Morley (47), David Moran for Bryan Sheehan (49), Jonathan Lyne for Brian O’Beaglaoich (52), Barry John Keane for Darran O’Sullivan (54), Michael Geaney for Donnachadh Walsh (57), Anthony Maher for Kieran Donaghy (64). Scorers: Stephen O’Brien (1-5), Colm Cooper (1-3, 0-1f), Paul Geaney (0-5, 0-1f), Barry John Keane, Darran O’Sullivan (0-2 each), Bryan Sheehan (0-2f), Paul Murphy, David Moran, Killian Young, Anthony Maher (0-1 each). Yellow cards: Donnchadh Walsh, Paul Murphy, Jonathan Lyne. Barry John Keane.